Tommey Walker of Detroit vs. Everybody. Nothing in the Motor City comes easy. It's winter, seemingly, for half the year. People here are skeptical of hype, and rightfully so. Detroiters can be a tough crowd, and you have to be Detroit-tough to survive and thrive here. It's no minor feat to be Detroit-approved. Once again, we wanted to find out who is leading the pack. So we've quizzed readers in our annual Best of Detroit Poll, tallying the winners across 10 categories: Arts and Music, Bars and Clubs, Casinos, Drinks, Food, Pampering, Public Square, Retail and Services, Sports and Recreation, and Adulting. This is the Motor City's best of the best, according to you. 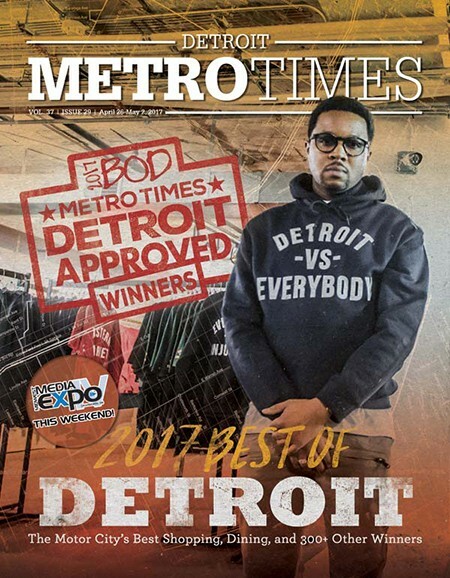 Take for example Detroit vs. Everybody — voted both Best T-shirt Company and Best Detroit Brand. There's a reason the slogan resonates with people here: It speaks to that Detroit-tough mentality. Truly, if you can make it in Detroit, you can make it anywhere. We've also included some of our own "Personal Bests," some sincere, some tongue-in-cheek — taking a few jabs at some of the most notorious newsmakers and stories of the past year. Best Brewery Taproom – The Great Baraboo Brewing Co.
Best Sports Bar (Washtenaw) – Wolverine State Brewing Co.
Best Hardware Store – Detroit Hardware Co.